AUGUSTA – Maine’s citizen legislature occasionally creates dynamics that look bad from the outside such as lawmakers voting on issues that affect their own interests. Farmers serve on the Agriculture Committee, lawyers serve on the Judiciary Committee, etc. The nature of Maine people electing “ordinary citizens” to represent them makes some situations virtually unavoidable. But sometimes interesting patterns emerge, such as the case with former Speaker Mark Eves, whose track record of private sector employment seemed to track along with organizations trying to protect or grow state funding. Maine’s online financial transparency tool, Maine Open Checkbook, provides us with another interesting pattern today, this time through Maine Examiner’s review of state data and records related to well-known Democrat State Rep. Drew Gattine, who has a history of clashes with Governor Paul LePage. Photo courtesy Rep. Drew Gattine Facebook page. 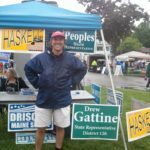 Rep. Gattine is a senior project manager at Optum, a national healthcare company, and was elected to the Maine Legislature in November 2012. Maine Open Checkbook does not show a single state transaction to Optum in the data available before Gattine’s election, which is available as far back as 2009. But in the period from 2013 to 2016, more than $52,000 in state funds flowed to Gattine’s employer, according to that state data. Miscellaneous professional fees are the description used to describe the transactions which make up the bulk majority of the cost of the expenditures, which largely disclose expenditures for the Worker’s Compensation Board and the Department of Health and Human Services. Rep. Gattine served on the Maine Legislature’s Health and Human Services Committee before being appointed to the powerful Appropriations Committee in the current session of the Maine Legislature.